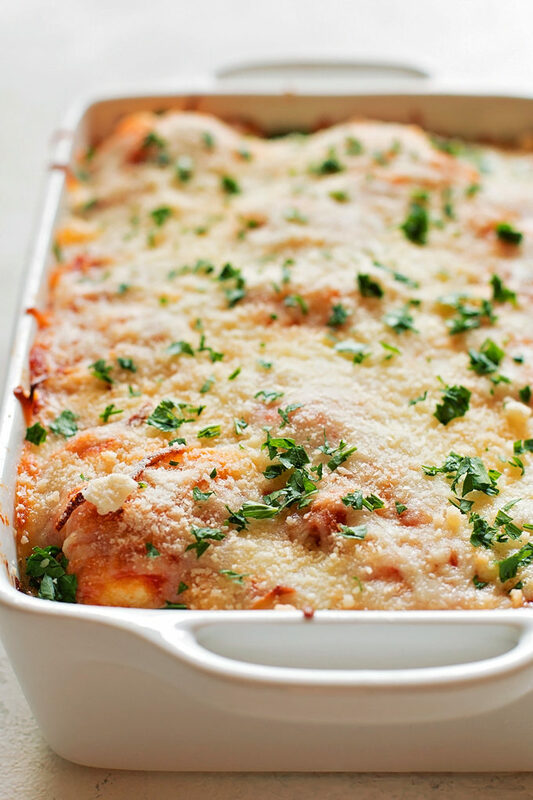 This baked ravioli is a dish even the kids will love! You can assemble it ahead of time and refrigerate it, then bake it right before dinner! I wasn’t planning on sharing this recipe, but life has been so busy that I haven’t done any recipe testing for almost a month now. It’s been kind of freeing. Not that I don’t love it, but it’s not always easy to find time to stop and take pictures while preparing a meal, especially during winter! So what do you need to make this? A jar of your favorite marinara (or about 3 cups of homemade sauce), a half pound of ground beef, a quarter pound of Italian sausage, onion and garlic, 3 cups of spinach, seasoning, a 20 ounce package of your favorite ravioli, 1/4 cup of finely grated parmesan cheese and 2 1/2 cups of shredded mozzarella cheese. 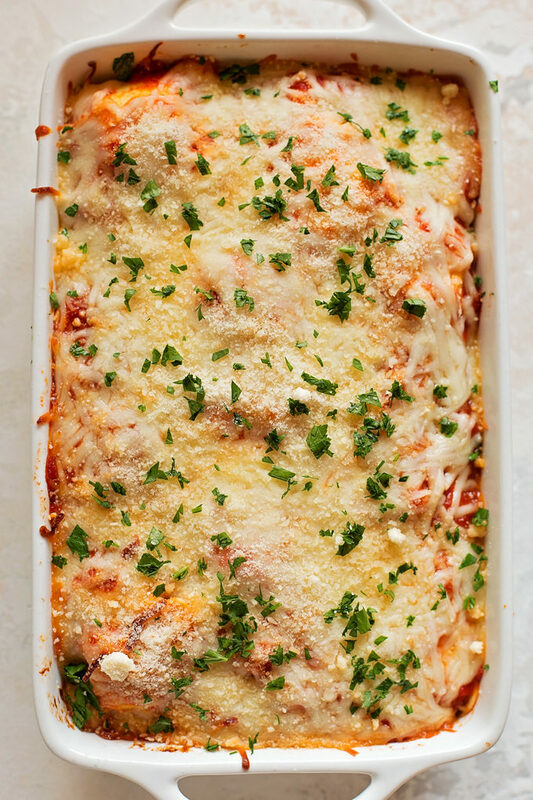 Layer everything in a baking dish starting with sauce, then a layer of pasta, then ground beef, more sauce and cheese. Repeat once more. You can either cover it and place it in the fridge until you need it or bake it right away. It’ll bake for 30 minutes with foil over top and 15 minutes uncovered. You can sprinkle the top with freshly chopped parsley (or basil), but it’s really just for a pop of color. This cheesy, meaty dish is hearty and full of flavor. You customize it however you like, something I love! It was a huge hit with the kids and myself. I hope it will be a success with you too. In a large skillet set over medium heat, add olive oil. When the oil is hot, add the onion and saute until translucent, about 3-4 minutes. Add the garlic and cook until fragrant. Add the ground beef and sausage along with the Italian seasoning, garlic powder, and black pepper. Cook until browned. Add spinach and wilt, about 4-5 minutes. 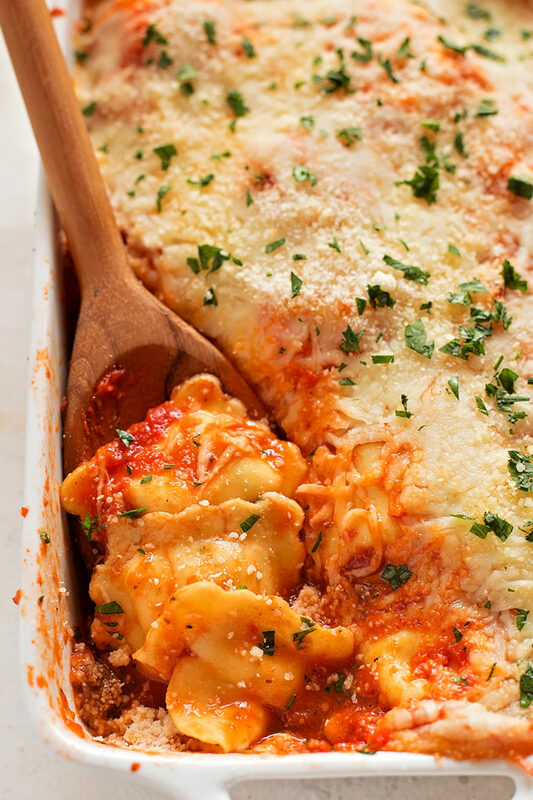 In a 9×13-inch baking dish start by adding 1/3 of the pasta sauce. 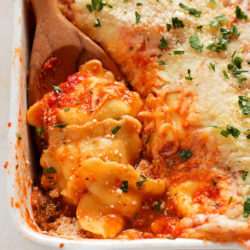 Start by layering the dish with half of the ravioli, then half of the meat, 1/3 of the sauce, and half of the cheeses. Repeat with one more layer using the remaining ingredients. Cover the top of the dish with aluminum foil and bake for 30 minutes. Remove the foil and continue baking for an additional 15 minutes. Remove from the oven and allow to rest for 10 minutes before serving. Garnish with freshly chopped parsley or basil if desired. – You can also make this in a slow cooker. Heat for 3 hours on high or 5 hours on low. – Mushrooms make a great addition to the ground beef/sausage mixture. Oh YUM! This looks so good! We always have a pasta side dish for every holiday and this would be perfect for Easter! I’ll give it a test run for an easy dinner one night. That’s so much! Made this over the weekend and doubled the recipe. I got 3 foil pans full: one for my family of 3, one for my parents and one for a friend who is not in great health. Absolutely delicious!! Kept mine in the fridge and brought it to room temp a few hours before baking today. Baked at 350 for 40 minutes with the foil on the 20 minutes without foil. It was perfect. Served with some garlic bread. I just love your recipes Natalie! And I will make this as our pasta dish for Easter. Awesome recipe that can be made ahead of time with great ease. Well done! Do you cook the ravioli before assembling the dish? Did you use refrigerated or frozen ravioli? Will that make a difference in preparing it ahead of time? I want to make this with refrigerated ravioli and prepare the night before, will that work?? Can you make this ahead and freeze it? Have you tried using frozen ravioli that you defrost first? I always have Trader Joe’s ravioli in my freezer.